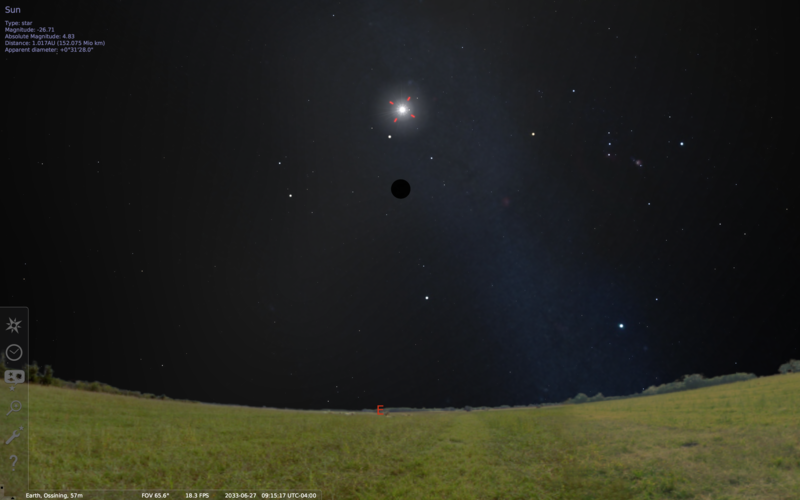 Stellarium can help you see sky patterns and practice Physical Astronomy. By following this article you will be able to see the analemma moving – a figure 8 shaped path that the Sun follows yearly. Above is a composite image that shows the position of the Sun in the morning sky each week. The pictures show every Sun position frozen in the sky each week at the same time of day: early in the morning. The June weeks are at the top left, December weeks at the bottom right and April and September weeks are in the middle at the crossing of the figure 8. The analemma is easier to see when it is animated. In this visualization we will be using the Time Control features of Stellarium. Here is a quick tutorial on time control. Open Stellarium on your computer. (Download it here if you don’t have it already). Set the time to around 7:00am local time. Use time speed control keys J, K, L.
Command + F and type “sun” (with no quotes) into the window. Hit the return key to select Sun. Lock the Sun into the viewport using the Space bar. This will keep the Sun in the viewport as we do some time travel. 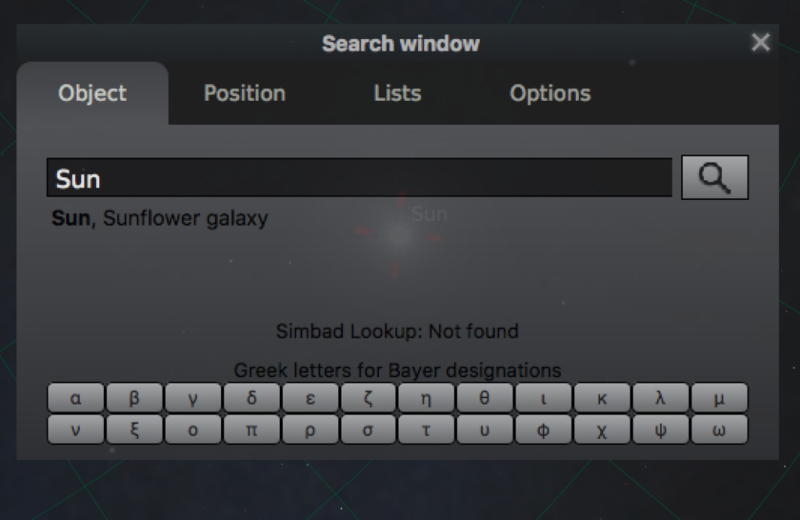 Stellarium screenshot showing the Sun locked in the viewport. Get to a good zoom level using the scroll function on the mouse or trackpad. A good zoom level is where you can see a little bit of ground and the Sun is in view. 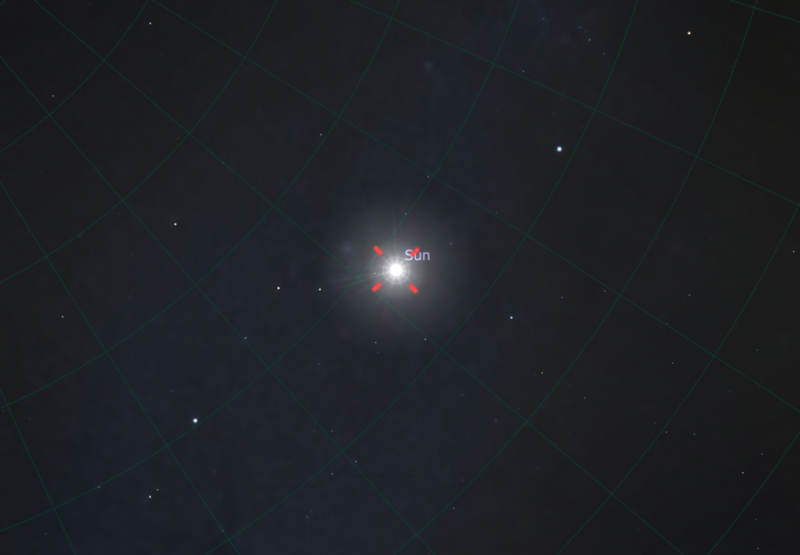 Stellarium screenshot – Sun at a good zoom level locked into the viewport. To see the Analemma we have to do some time travel. We are going to do a Day by day time lapse. Use the Plus (+) or Minus (-) keys to go day by day. Use the Left Bracket or Right Bracket keys to go week by week. Each time the day or week jump keys are pressed the Sun will seem to move in the sky. 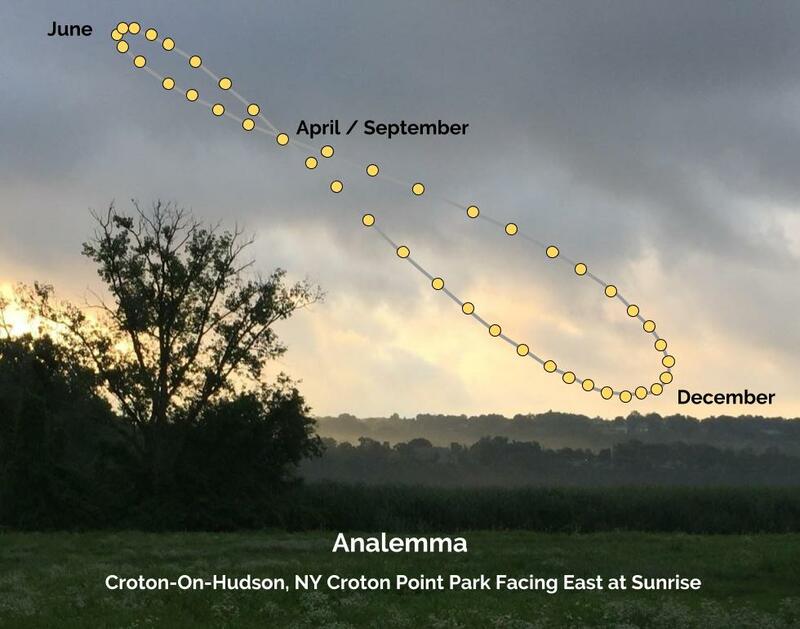 Observe the Sun moving in a figure eight shape, tracing out the analemma over the course of a year. The Sun hits the high point at summer solstice (June) and the low point at the winter solstice (December). This image, animation/visualization is correct for the Northern Hemisphere. At the equator the analemma is laying on its side. In the Southern Hemisphere, the Analemma would be upside down – the big loop of the figure 8 on top. You can use the Z key to turn on “Zenith grid” to see the exact degrees of change as the Sun travels on the Analemma path. You can also try out the Equatorial and Azimuthal mount feature in Stellarium. The mount style will change the way the Earth moves on the screen. Use Command – M keyboard shortcut for that. A really neat article on scienceblogs that talks about the analemma in depth.